A small, plain log. 150g. 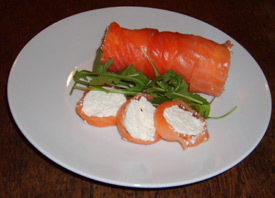 Wrap a plain Wealdway log with smoked salmon slices. Slice as required and serve. of the mushroom, cook on for 5 minutes. Drizzle olive oil over top of cheese and finish under a medium grill until golden brown. Can be served on toasted brioche. Decorate with salad leaves or rocket. A small log either plain or coated in herbs or spices, very pretty. A useful dinner party cheese. Try baking in flaky pastry. 150g. Cut plain Wealdway log into slices and line the bottom of an ovenproof dish. Roughly chop strawberries to cover. Sprinkle with sugar and bake in a pre-heated oven at 200oC for approximately 4-7 minutes (dependant on size of dish). Mould ripened and matured Medium/strong flavour. Cut a soft Wealden in half and place on an ovenproof plate. Drizzle with olive oil, add a twist of black pepper. Grill until golden (approx 5 mins). Serve with a spoonful of redcurrant jelly or honey and dressed side salad. Mould ripened and matured, with a stronger flavour. Goes well with a glass of Port. Cut a 4 inch square of flaky pastry. Cut out the corners to enable the sides to be folded in by approximately 1⁄4 inch. Finely slice a red onion into rings and fry in a little olive oil until they soften. Add a splash of balsamic vinegar and a tablespoon of brown sugar. Stir until the mixture thickens. Place the onion mixture in the centre of the pastry square and top with a slice of Wealdway log, approximately 1 inch thick. Drizzle with olive oil and bake in a pre-heated oven at 220oC or gas mark 7 for 15- 20 minutes until golden.